When I started working through recipes, trying to figure out what I was using and where the ingredients come from, I found that there is one group that is almost never local--spices. Of all spices, there are two that are so important that many recipes don't even tell you how much to use--just "add to taste". Salt is everywhere. Salt can be used in everything. It's the only rock we eat. And we eat a lot of it because our bodies can't produce sodium on its own, even though our cells depend on it. It's an essential part of our bodies. I wondered about where salt comes from. I have some very nice foreign sea salts at home, as well as smoked salts, black salts, spicy salts, chunky salts, kosher salt, table salt, and other finishing salts. But none are local. So, I started looking around for local salt. Considering that we live right next to a giant salty ocean, I thought this would be easy. But I was so wrong. I could not find local salt anywhere. Not even at The Meadow. This was really confusing to me. Did you know that if you go out to Seaside, at the beach there is a Lewis and Clark historical monument that describes how they made salt there in brass kettles? Remembering this gave me an idea. I could boil the ocean and make my own salt! I had big plans for making salt. I figured there could not be that much salt in ocean water, so I planned on camping on the beach for a weekend, starting a fire, carrying buckets of water up to be boiled down for two days straight. I would return home Sunday night--dirty, smoky, with a bag of precious salt that would make all our meals taste magically better. That's the way Clark would have done it. Doing some research, I found that you cannot camp on the beach in either Oregon or Washington. The coastal campgrounds are all a hundred yards or more back from the beach. None have spots on the actual beach. Camping in non-designated areas is illegal, and it is impossible to make salt in jail. Also, the Oregon coast in February is nothing but wind and rain. Both of which make campfires really hard to do. Reality was sinking in that this might not work. I might have to just settle for French sea salt (horror!). 7 gallons x 8.5 lbs = 60 lbs of water x 3.5% salinity = 2 lbs of salt. 2 lbs of salt sounded perfect! I wouldn't need to camp at the beach after all! The project was back on track. When I told my wife that I wanted to go to the coast for the day, she thought that was a great idea. We'd bring the kid and the dog and have a beach day. That weekend the weather was surprisingly nice--we'd only need scarves and windbreakers. Oceanside is our current favorite beach. It is not too busy, the dogs can run, there are places to eat nearby, and the drive out through Tillamook State Forest is nice. Additionally, Oceanside has very clean water. In February the ocean water in Oregon is very cold. I'd hoped that I could somehow dip the jug into the water or lean it over and scoop up water. But the 7 gallon thing is too big and I had to keep walking out further and further to get it submerged to get the water inside. Pretty soon I was up to my waist in ice cold water, waves rolling into me and my giant blue jug, with people watching me from their dry blankets on the beach. I got much wetter than I'd planned. Actually I was soaked. But 7 gallons was mine! Hazel and Kim kept their comments to themselves. Once home, I started working on how to get the salt out of the water. You have to evaporate it. My first thought was baking it in pyrex dishes. 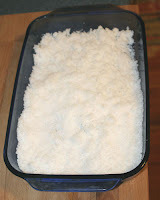 My thought was that slow evaporation would be nice because I could maybe get some nice Fleur de Sel-ish salt crystals. But 4 hours later, all I had was a teaspoon of salt powder. Then I moved to just boiling it in my ceramic dutch oven. This worked good, except the off white interior made it hard to tell what was going on. And as the water evaporated and thickened, it started makeing weird "Pang!" noises that made me imagine my pot was going to explode. What worked the best was the old fashion way. 4000 years ago chinese salt makers boiled down water in pans (read Salt for more info. It's amazing). This method still works today! Although it is slow, it is reliable and easy. Using a stainless steel 8 inch omlette pan worked great. In the end I boiled about 6 gallons of water, and now I have about 1.75 lbs. of pure, local, Oregon salt. 1. Convince yourself this a what you really want to do because people will outright laugh at you when you tell them you are collecting 7 gallons of ocean water to make your own salt. They will also stare and point when you walk yourself fully dressed into an ice cold ocean with a giant blue jug. Good times. 2. Get a big jug. 3. Find a beach with clean water and be prepared to get very wet. 4. Filter the water through some fine mesh cloth to get out sand and other bits of stuff. I used a clean white t-shirt. 5. Use a non-reactive pan to boil the water down. A stainless steal omlette or saute pan works best. It will take many hours. Plan several days. 6. Use a splatter guard because the water splatters a lot as it thickens. 7. Finish drying the salt in a glass dish. Rake it occasionally to keep it from clumping up too much. 8. Enjoy it more than any other salt you've ever had in your whole life. Wow. I can't believe you got that much salt from only 7 gallons of water. I also can't believe you'd walk into an ocean in February. I think I'll wait till summertime to test this recipe! While I won't be making salt anytime soon, I applaud the effort. Can't wait to hear about what you do with it. Cool. How does it taste? And how big are the crystals/flakes? I'll bet it's really great on popcorn.